Interview with Anne Easter Smith | Wendy J. Dunn, Award-Winning Author. Wendy J. Dunn: Do you agree, Anne, that Richard III is an overworked subject in historical fiction? Anne Easter Smith: Judging from the e-mails I have had from people all over the country, sadly Richard is only just getting on their radar screens because of my book. This is not to say there haven’t been plenty of Ricardian novels over the years — some good and some not so — but I think having a major publisher like Simon & Schuster behind mine has given it wider visibility, that’s all. But compared with Tudor fiction in the last few years, Richard can’t hold a candle!! As a member of the RIII Society, I know at least four people writing and more than that who have published Ricardian novels, but I don’t know how big of an audience they have rated. So far my book has sold 23K – which S&S tells me is very good for a first-time novelist in five months. Just wish I could sell it in Oz and NZ — and then perhaps the UK will take note! It will be out in Germany next month (“Ach, du liebe!”) and has just come out in an audio book, which is terribly exciting. I have the same actress who read Bridget Jones’ Diary and sequel. She’s awfully good. W.J.D. : You say you admire Richard III – can you please tell me why? A.E.S. : My main reason for admiring Richard is his loyalty: first to his brother, holding the North strong for him without any power moves to challenge Edward for the throne, unlike brother George; to his wife in their marriage, although we know he had two bastards, they were old enough to have been born before that event and there were certainly none later; and to those two children, whom he took into his household and treated like royalty. That is why I chose to give him one mistress–I think he was someone who was fiercely loyal to those he loved. And that is why I do not think he murdered the princes in the Tower— they were his nephews and sons of his beloved brother. Richard was also a just ruler of his subjects–despite the short reign, he improved the judicial system for commoners and other than the odd execution of Hastings, was fair-minded when dealing with people. Even though he knew Elizabeth Woodville had plotted to keep Richard from being Protector of young Edward, he persuaded her to leave sanctuary and come and live at court. Surely she would have refused had she thought he had killed her sons. W.J.D. : Do you have any firm theories about likely fate of Edward IV‘s two sons?? A.E.S. : I think I pretty much laid out my whole theory in Rose for the Crown! expected it to be published, I was floored by the prospect of writing another book. My agent mentioned that I had come away from the research on the first book with an interest in Margaret, so I figured I could probably use all the knowledge I already had on the period to construct a plausible story around her. What I was not reckoning on was becoming so engrossed in this new character that I ended up liking her even more than my Kate Haute! What an intelligent, intriguing woman she was. And yes, indeed, Ann Wroe’s Perkin or The Perfect Prince was a useful resource. Ann and I had tea in London when I went to England and Belgium to do research on Margaret, and we struck up a nice friendship that has lasted on email. She has been invaluable in helping me write this second book. In fact, Perkin’s story may be part of the next book I am beginning to think about. Daughter of York is supposed to be on on the shelves by next April. W.J.D. : Can you tell of the day when you realised that S&S was about to take you for the ride of a life time?? How much has it changed your life? A.E.S. : I had just recently returned from a RIII Society annual conference in Toronto (the first joint Am/Canadian one) and people knew my agent was shopping the book. It had been doing the rounds since August with the first five editors targeted by Kirsten. It was now with the second five and I figured I didn’t have a prayer, although Kirsten told me that many times it takes a dozen or so before you might get a hit. I was alone in the kitchen making myself a cup of tea when the phone rang. It was Kirsten. 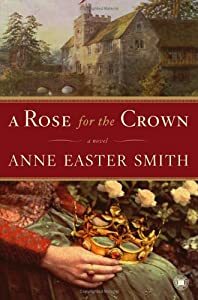 “Am I talking to the soon-to-be published author Anne Easter Smith?” I almost fell off the counter, where I was sitting swinging my legs waiting for the kettle to boil. She then proceeded to tell me about this fabulous — for a first-time novelist — deal that Touchstone Fireside (a division of S&S) was offering me. I had no idea whether it was fabulous or not, because I had not a clue how these things worked. I had to take Kirsten’s word for it. “Now part of the deal,” she continued, ” is that she wants a second book from you.” This time I had to sit down on a chair and put my head in my hands. “Another book?” I groaned, “but I’ve never thought about writing another book, and this one has taken me seven years!” Kirsten waited a beat before adding, “and I need a proposal in 24 hours.” Blimey, I thought! Well, I quickly decided that Margaret of York had intrigued me enough during the research of “Rose” that I could probably write a good story around her, and S&S accepted. It only took me a month of understanding the timeline for the second book (a year after I finished the edits on the first) to make me quit my lovely job as administrative director of a music school so I could write. I immediately made plans to go to Europe on a research mission for three weeks in January 2005 and I really haven’t stopped since. I have to confess I was not prepared for the fantastic response I have had for Rose in the form of sales, complimentary emails and requests to talk at libraries and book clubs. It all seemed as though it was happening to someone else. I certainly have not gained celebrity status 😉 but I still get a thrill when I see someone carrying my book. My husband drags me into bookstores wherever we are traveling and asks the manager if they’d like me to autograph whatever copies they have. I wouldn’t dare to present myself to the manager for fear of being told “Who are you? And how do we know you are who you say you are?” My British “never blow your own trumpet” rise up at these moments! Luckily, I’m married to an American who has no such inhibitions! The only negative aspect to all of this is that I do not have a regular income anymore. Authoring certainly doesn’t make you rich even if it makes you famous – unless you are a Stephen King or perhaps Philippa Gregory! I have to sell 100,000 of both books before I see any more income after the initial advance. That could take many years, although Rose has hit the 25,000 mark after six months, so hopefully when Daughter of York comes out I can eat more than baked beans again!! W.J.D. : You’ve covered so much that I think two more questions would be more than enough for this interview. What authors inspired you as a child, teenager, now? Any advice for aspiring writers?? A.E.S. : I began to read historical novels as a pre-teen with books like “The Woods of Windri” by British author Violet Needham. Then I moved on to reading all of Jean Plaidy’s royal series and Georgette Heyer. At age 18, and traveling up and down in the train from home to my job in London every day, I set out to write my own Georgette Heyer once I realized I had read every single one of hers. It still is in my trunk upstairs in the attic today — all six wishy-washy first chapters that got abandoned once I got a flat in London and the social life took over! But the single most important influence in writingThe Rose for the Crown (my first finished book) was Anya Seton. I have read Katherine, The Winthrop Woman and Green Darkness several times. For research prowess, I have to hand it to Edward Rutherfurd for Sarum and London. He is a goldmine of information about every period. My advice for aspiring writers is, don’t give up. I set out to write Rose without one single writing class to my name in my whole life. I had no clue how to structure a book or how to flesh out a character. I just had fun with it and tried to write a book I would enjoy reading. If anyone else wanted to read it, then that was gravy! I did not set out to write a book that would be published. I just set out to write a book.